There are crate engines and then there are crate engines that rock. Weighing in at a little over 500LBS the Cummins® R2.8 is the lightest and smallest out of the ISF family. Its four-cylinder burner will get you 161 HP at 3,600 RPM and the best part of 270 LBS-FT of torque at 1,500 – 3,000 RPM. On the road you’ll get a decent 20 MPG, so as you can see, its compactness is matched by its power, which is why it’s the optimum choice for light commercial vehicle applications such as pickups, trucks, vans, utility vehicles. Off-road is really where it excels. Chosen as the official Ultimate Adventure vehicle engine in 2017 (and is again in 2018), it powered through the desert in temperatures approaching 130 degrees. It gave a massive 300 miles of slog before needing a re-fuel and used around a third less fuel that its gas-powered counterparts. It motored over some of the roughest terrains with relevant ease. Costing slightly below $9,000 it comes with everything needed for a diesel swap – and is of course, mostly smog legal depending on your local and state regulations. So, let’s take a look at what you get for your money. The gleaming new Cummins® R2.8 turbodiesel crate engine comes with: a cam-driven vacuum pump, a 120-amp alternator (internally regulated), a power steering pump, a wastegated Holset turbo, a DOC exhaust downtube, a remote oil filter, EGR and oil coolers, a full wiring harness and engine control module, an ECU and a throttle pedal. It also comes with a space for a A/C compressor, though that is not included in the purchase price. You’ll also get continued improvement offers and Cummins support. When it arrives in its wooden crate, plastic wrapped for safety, you’ll find that the wiring harness is already installed. 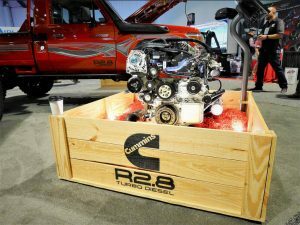 The Cummins R2.8® engine has a cast iron cylinder block with sleeves, which could be replaced. This gives it greater strength using less material, as the simple and cheap material provides low cost along with reliability. The R2.8 has a cast iron cylinder head with four valves per cylinder, each housing a chain-driven single overhead camshaft and a fuel injection nozzle. The camshaft actuates valves by rocker arms (short ones are for intake valves and long ones are for exhaust valves). They are made with heat-resistant steel and chrome plated stem. Though they have the same design, they’re not interchangeable. As you’d expect from a Cummins engine it is equipped with a electronically controlled Common Rail fuel injection. The high-pressure fuel pump is mounted on the front end of the engine and is driven by camshaft through the gear. The turbocharger is a HE 200 WG without an intercooler. The engine is equipped with start-up relief devices at low temperatures and an electric spiral is provided for heating the air in the intake manifold. So just how easy is it to drop one of these in? Christian goes on to say, “In reality, all you need to do is hook up a couple of electrical leads, dunk a fuel pickup tube into a diesel container, and fire it up.” However, most engines swaps are simply not that easy. No one vehicle is the same in terms of chassis layout and room. There will always be the motor mounts, rear or forward sump pump positioning, turbo and exhaust manifold modifications, axels, suspension and flywheel housing mount with the transmission. This article explains in-depth about how to drop in a crate engine. So, are there any negatives and how does it measure up with the old reliable 4BT? There’s a fine line between price and quality. There have been some complaints that there is a quick tearing of the cylinders because of the low quality of the materials. As a result, it can increase oil consumption. The connecting rod bearings are prone to failure, which can cause damage to the crankshaft. It only carries a 90-day warranty, which is also a concern. Standard 4BT Crate Engines come standard with a 6-12 months unlimited miles warranty. For guys who want to modify the R2.8 fuel system any sort performance upgrades will instantly void the warranty. The Bosch Fuel Pump is all electronic as is the emissions control systems which means removal of the governors, adding higher RPM fuel springs and adding some 550cc, 12 mm injector nozzles isn't going to fly with the R2.8! With all electronic engines, more moving parts equals more points of failure as well as expensive parts/time in the shop. With a new Crate Mechanical 4BT Engine you get the same horsepower, more torque 370 LBS-FT vs. 267 LBS-FT, no emissions equipment, no electronics and 35 years of knowledge on the performance modification side. The price for a 4BT Mechanical is also about half the cost of the R2.8 which can be off-putting for many enthusiasts. 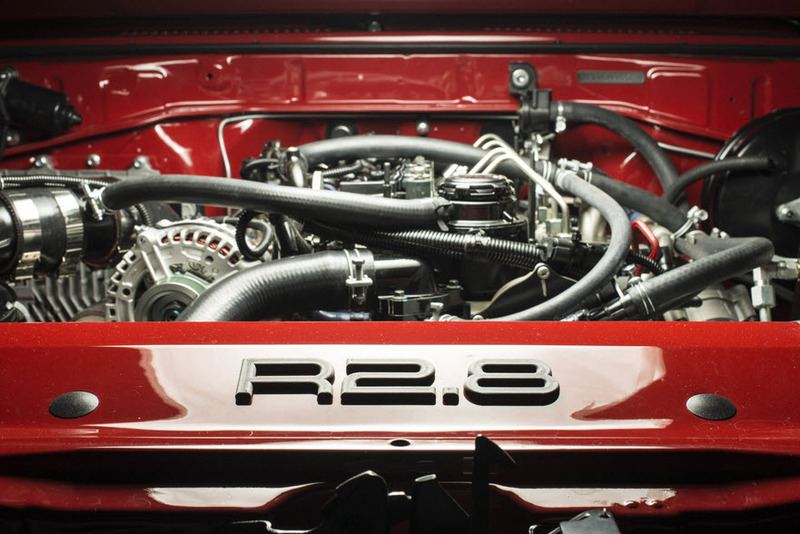 However for all of the rabble rousing between cousins the R2.8 looks like a cool engine. So, to sum up, a few minuses but a lot of pluses; and only time will tell how the engine performs out there on the trail long-term.